Wild swimming is one of the easiest mini adventures you can have. Whether it’s a spontaneous dip on a hot summer’s day, or a well-researched dive into a secluded beauty spot, swimming outdoors in a river, a lake, or the sea offers a speedy way to reconnect with nature and wash your worries away. By definition, wild swimming in the UK means immersing yourself in COLD water! Whilst this might not always be the most appealing prospect, scientists have identified many physical and mental benefits to taking the plunge. Cold water swimming has been shown to improve the immune, lymphatic, circulatory and digestive systems, reduce muscle inflammation, and boost happiness levels too. When it comes to choosing a location for your wild swim, the South West of England is hard to beat. Craggy coastlines dotted with hidden coves, rugged moorland with secret pools and waterfalls, and tree-lined rivers with abundant wildlife – if you’re looking for a beautiful backdrop to your swim you’ll be spoilt for choice. Lansallos is a small yet stunning sheltered beach 2 miles west of Polperro, offering perfect wild swimming conditions for the whole family. Park in Lansallos village near the church and then follow the path for a beautiful 15 minute walk down through the woods. Follow the passage hewn through the rock by smugglers in bygone times into the cove where the crystal clear water will tempt you in for a paddle or swim, whatever the season. Find your perfect Cornwall holiday cottage near this wild swimming spot. The River Teign below Castle Drogo flows through a spectacular wooded gorge and into a large river pool known as Salmon Leaps. The water here is shallow (around 1.5m at its deepest), flowing into 3 stone plunge pools, with grassy banks on the side – ideal for family picnics. Swimming here is relatively safe, and children of all ages will be eager to jump in. However, do take care with the ‘slide’ exiting the bottom pool, which is fast flowing and can direct you towards a large hidden rock. Families would be wise to place an adult at the bottom to catch young children, and scout the area for any other possible submerged objects before children dive in. To find Salmon Leaps, follow the footpath down from the National Trust car park at Castle Drogo. The lovely woodland walk leads you down to the river and this idyllic swimming spot. Find your perfect Dartmoor holiday cottage near this wild swimming spot. The dramatic headland at Prawle Point – the most southerly in Devon – features wild, rugged cliff top walks with beautiful white sandy beaches below. 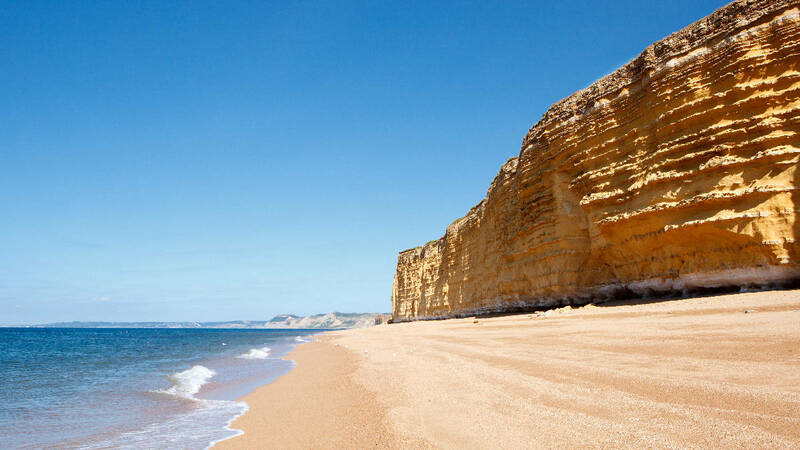 Moor Sands is one of the most alluring, and the most remote, making skinny dipping an option. Find it by taking a scenic 1.5 mile hike west from Prawle Point car park just beyond the village of East Prawle – the effort is more than worth it, and will warm you up in preparation for your dip! Access the beach via a track leading down the cliff-side, using a rope to help you drop on to the beach. The sheltered cove with several rock islands provides ideal wild swimming conditions, and if you’re lucky, you might even be joined by a seal. Warm up afterwards with a drink at the legendary village pub, The Pig’s Nose Inn, back in East Prawle. Find your perfect South Devon holiday cottage near this wild swimming spot. 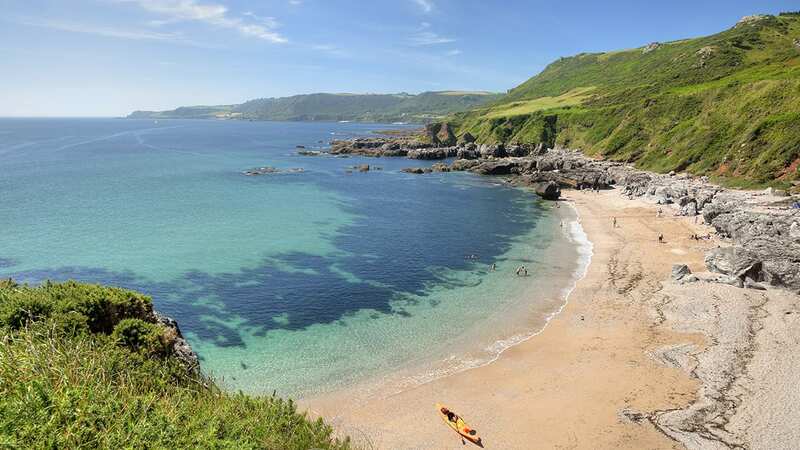 Hidden away on the edge of Exmoor, on the north coast of Devon between Watermouth and Combe Martin, you’ll find two enchanting secret swimming beaches at Broadsands. Nestled beneath wooded cliffs, this double cove has caves galore to explore, two secluded shingle beaches offering sheltered swimming, and a little island too. To find the beach, first head to the woods near Sandy Cove Hotel, 1.5 miles west of Combe Martin, then look out for the long narrow stairway that leads you down to the water’s edge. Find your perfect Exmoor holiday cottage near this wild swimming spot. The small seaside resort of West Bay, near Bridport, boasts two shingle beaches either side of the harbour. East Beach is the more sheltered one, with lifeguard cover during school holidays, and therefore offers the ideal location for a spot of sea swimming, especially if you’re looking to cover some distance. The seabed shelves quite quickly here, and there is often plenty of boat traffic, so it’s best to swim along the coastline. Set your sights on the Hive beach and you’ll clock up an impressive 3.5km. The lovely beach café here provides a great excuse to pause and refuel before walking back along the beach to your starting point. Find your perfect Dorset holiday cottage near this wild swimming spot. Wild swimming is one of the most natural things in the world – an activity mankind has enjoyed for millennia. However, today many of us have forgotten this easy way to connect with our environment. Take the time to appreciate your new-found perspective from water-level, and the unique feeling of freedom wild swimming offers. It’s sure to be one of the most memorable experiences of your holiday, and one you’ll be keen to repeat as soon as you can. Always check tide times, currents, rip tides and weather conditions before setting off on a wild swim. Always take care around water with children. If you’re taking the little ones, it’s best to choose a river, lake or the sea where there’s a gently sloping beach for easy entry and exit into the water. Also check the depth and whether there are any hidden deeper holes before you let them paddle. Cold water reduces your swimming ability, at least until you acclimatise to the temperature. Children should stay close to the shore and gradually increase their range. Warm up both before and after a wild swim with exercise and warm clothes. Wet suits offer additional protection against hypothermia if you’re planning to be in the water for a long time. Try to avoid swimming alone, or at least tell someone where you are and what time to expect you back. Never jump into water you haven’t checked for depth and obstructions first. Always identify a safe exit point before you enter the water. Watch out for boats. If there is likely to be boating traffic, wear a brightly coloured swim hat (and swim float) to make sure you can be seen. UK rivers and lakes generally have good water quality, however be aware that this decreases during droughts or after floods. If you’re unsure of the water quality, keep cuts covered with waterproof plasters and your head out of the water (swim breaststroke). Footwear (such as old trainers or wetsuit boots) is a good idea as you will be able to explore better and will protect your feet from cuts on rocks and glass. If you are using inflatables, check currents to ensure you won’t drift away. Buoyancy aids are safer for non-swimmers. Have fun and make the most of the experience!